The action took place in the streets of Athens, with the artist distributing flyers to the public at the entrances of museums, theaters and government buildings. A silent protest that attempts to unify the two worlds in which he lives: "Shut down the museums! ", "No more electricity cuts, cut our art instead! ", and other slogans. The public reaction to the work instigated Diafas into performing an action on the opening of the Acts of Engagement exhibition, where he invited the visitors of the exhibition as well as the public from Omonoia Square into the Bagkeion building. Chanting "censor-sheep" he lowered the banner , read the manifesto which raised the question "How can art be made when everything around you is dying?" and rallied the public to chant the "censored" slogan (We want an art for the starving...), placing the artwork in a more conventional exhibitional manner. The question "What can we do with art when we are starving" remains for the artist, open. 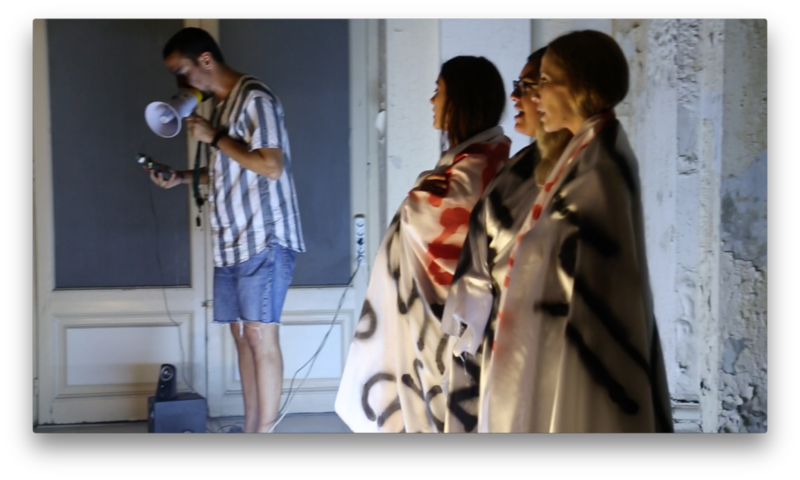 Tomas Diafas developed and presented the project in the context of ACTS OF ENGAGEMENT, a ten-day collaborative working cycle for art in the public sphere, organized by C.A.S.A. in the context of the Athens Biennale AB5to6. Through the program artists and researchers from Greece and abroad explore in a ten-day workshop the role of art outside conventional art spaces and how audiences and residents can be involved into action while re-examining the function of the urban public space of Omonoia square, in the center of the city of Athens.